Growing your business is less about finding a well-hidden secret and more about the little things you do on a daily basis. Success is really based on your mindset and everyday habits. You may be unconsciously holding onto certain habits or mindsets that limit your productivity and forward motion. 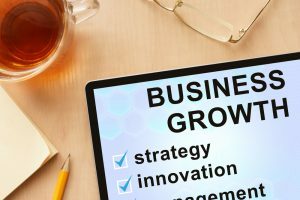 Here are four habits that support business growth. Most people are vulnerable to distractions. For you, it may be YouTube videos, Facebook, email, your dog or something else entirely. For online distractions, apps such as StayFocusd can help you stay away from email and social media. Set your smartphone to Do Not Disturb. Close your office door and tell people not to disturb you unless it’s an emergency. Do whatever you need to do to focus and minimize distractions. When you think about the future do you tend to imagine a successful outcome or do you tend to worry about everything that might go wrong? Business growth always requires a certain degree of risk. If you make decisions with worst-case scenarios in mind, you’re in survival rather than growth mode. This doesn’t mean you should be reckless. The most successful entrepreneurs know how to take calculated risks based on experience, market conditions, and research. Rather than thinking about potential disasters, shift your focus towards opportunities and potential ways to grow your business. Do you suffer from “Bright Shiny Object syndrome?” This is the tendency to buy every new device, course, or product that will supposedly help your business grow ten times faster. Every week there are new “game changers” and supposedly revolutionary methods to skyrocket your profits. Most of these end up costing you money, diverting you from your fundamental business model and leaving you disappointed. The criterion to use before trying something new is whether it’s truly relevant to your business model and goals. If not, ignore the temptation to hit the “buy” button and get back to work. The way you manage time has a huge impact on your results. Suppose you have five tasks on your to-do list for the day but only complete three of them. If this is your pattern for the week, this translates into ten tasks left undone. If you could improve that so that you complete at least four out five, that means you’ve done five additional projects at the end of the week. Most people do better when they create a strict schedule with blocks of time assigned to a specific task. This helps you avoid the trap of jumping from one project to another. When you give yourself a deadline to finish a certain task you have a better chance of actually finishing it. Business growth demands a great deal of effort and discipline. It also requires you to maintain a positive attitude that focuses on opportunities rather than catastrophes. The above tips will help you overcome some of the most common obstacles to growing your business. Aside from habits and mindset, one of the things that stand in the way of business growth is lack of cash flow. You need capital to grow your business whether it’s to purchase inventory, hire employees or invest in marketing. Conventional financing options such as business loans aren’t always available or sufficient for your needs. One creative and effective way to quickly improve your cash flow is invoice factoring. One of the industry leaders in this field is Riviera Finance, which has been helping businesses find custom financing solutions for nearly 50 years.